Your dad just got home for a month long vacation in the Middle East. You are both sitting on a California cliff watching a warm Atlantic storm move inland. Sitting next to you is a duck telling you to buy Canadian stock options. You smile as your dad hugs you. You aren’t sure what is happening, but it reminds you of a heaven that was never spoken by the priests of your fathers. 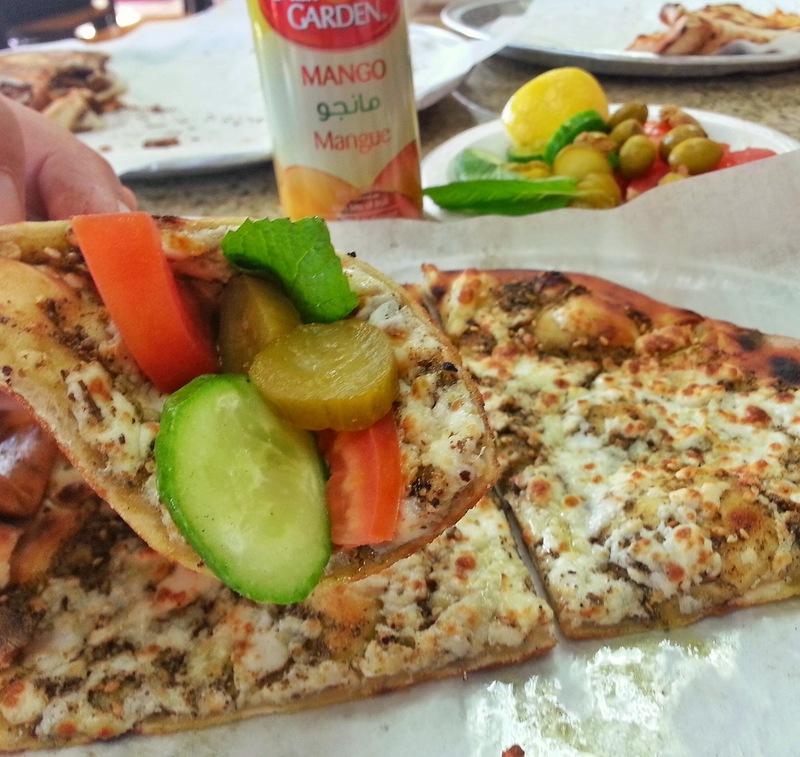 Go ahead, put your nose about six inches from the top of the Zaatar and Cheese pizza at Al Amir Bakery in Anaheim– smell, what I described is the best I can do to explain what you are smelling. It’s unlike anything you regularly smell, or eat an yet it smells like heaven. Make sure to get the small side veggie plate and fill your slice with that fresh, crisp, contrast. Buy a mango drink. The whole thing is far less than a plane ticket to the Middle East. Less than 3$. That’s right. A heaven you can finally afford. Located near a heaven you can’t afford. Disneyland. PS- I’ve seen it spelled Zaatar, Za’atar, but never Zaater, either there’s a typo on the sign in the store or it’s a new way of spelling it, I’ve never seen. Even on their website they spell it Zaatar. Posted in Anaheim, Lunch, Middle Eastern, Pizza, Southern California, VegetarianTagged anaheim, California, Cheese, Disneyland, Lunch, Mango, Middle East, Middle Eastern, Pizza, Restaurant, Southern California, Zaatar, ZaaterBookmark the permalink.